Roselle Park Rita Pharmacy offers special packaging for customers interested in having their medications packaged for convenience. If you want easy dispensing of your medications, you can count on us. Our special packaging is aimed not just for the general convenience of our customers, but also to aid them in taking the right amount of medicine at the right time. Depending on what your needs are, our pharmacist can choose the right packaging for you. Give our pharmacists a call at 908-245-1396. 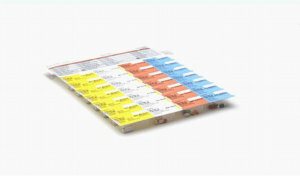 Med Pack is a patented multi-dose packaging system that makes it safe and easy to take medication. Each Dispill pack contains 28 individual blisters with a patient’s or person’s prescribed medication for a specific time (morning, noon, evening, bedtime) and date. MED PACK BLISTERS OFFER FAST ACCESS TO ESSENTIAL INFORMATION The top of each individual blister Pack lists the person’s name, the medication within and the time it should be taken. Going out for lunch or away for the weekend? Simply bring along the appropriate blisters! PLEASE CALL TO SCHEDULE A FREE APPOINTMENT TODAY 908-245-1396.